Where: Aggie Stadium, Davis, Calif.
How They Got Here: The Panthers won its opening round playoff game at home to Lamar narrowly 16-13 to improve to 7-5 . Key Player This Week: DE Rickey Neal has 53 tackles, 14.5 TFL, and 8.5 sacks on the season. He and the Panther defense will need to perform well against the strong, especially in the passing game, offense of UC Davis. How Neal the other line get pressure on Aggie QB Jake Maier will be the key to this game. Fantasy Bonus Baby: RB Marcus Weymiller has rushed for 922 yards and seven scores. He also has 14 receptions and two more touchdowns receiving. Look for the Panthers to play ball control in this game to keep the time of possession and Weymiller, who had a season-high 128 yards against Lamar, will be a big part of the Panther offense this week. How They Got Here: UC Davis is making its first ever Division I playoff appearance after tying for the Big Sky Conference title this year. The Aggies are led by former Boise State and Colorado head coach Dan Hawkins, who was a UC Davis fullback in from 1981-82 and was a member of the DII national runner-up team in 1982. The Aggies are one of the most prolific offenses this year in all of FCS. UC Davis’ 328.1 passing yards per game ranks third in FCS, and it’s sixth-best at 42.2 points per game. The only games that the Aggies didn’t score 40 points in were a 59-20 loss to Eastern Washington and a 30-10 loss to Stanford. After giving up an average of 32 points per game last year, the UC Davis defense cut that number down to 27.8 this season, which is the fourth-best mark among teams in the Big Sky. It also finished second in the conference in both sacks and interceptions. UC Davis was a DII power before moving up to DI in 2003 and were playoff eligible in 2007. 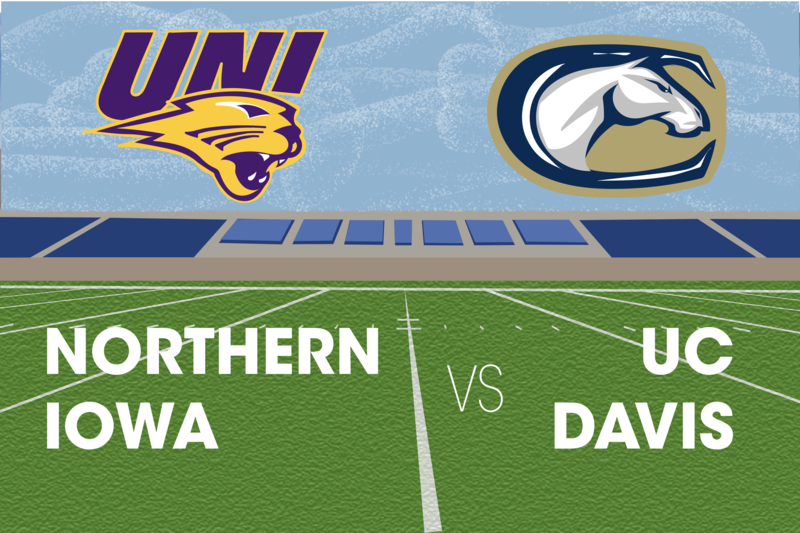 Playoff Floor: Playing against a hard-nosed MVFC squad like UNI, the Aggies could see its playoff season last just one week if UNI plays like it did against South Dakota State earlier. 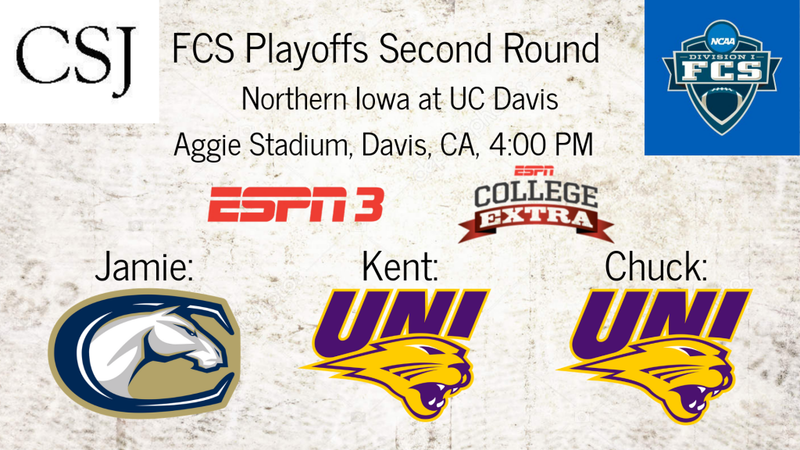 Playoff Ceiling: UC Davis could see a rematch against its worst loss to Eastern Washington in the quarterfinals but this seems like the ceiling for the the first time playoff participant. Key Player This Week: QB Jake Maier has thrown for 3,387 yards and 31 touchdowns while completing 65 percent of his passes with just six interceptions. He’s thrown for 300-plus yards five times, and has eight three-TD games this season. While UNI likely will be keying on stopping the pass game, Maier will need to make the necessary reads at the line to get his team in the right play. Fantasy Bonus Baby This Week: WR Keelan Doss has racked up 1,054 receiving yards and nine touchdowns on 100 catches so far this season. Even with UNI playing the passing game, look for Doss, who will likely be an NFL draft pick next spring, will get his share and should find the end zone in this game.